For the first seating of the United States Congress, see 1st United States Congress. In the end, the voices of compromise carried the day. 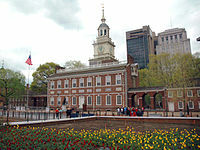 Rather than calling for independence, the First Continental Congress passed and signed the Continental Association in its Declaration and Resolves, which called for a boycott of British goods to take effect in December 1774. It requested that local Committees of Safety enforce the boycott and regulate local prices for goods. These resolutions adopted by the Congress did not endorse any legal power of Parliament to regulate trade, but consented, nonetheless, to the operation of acts for that purpose. Furthermore, they did not repudiate control by the royal prerogative, which was explicitly acknowledged in the Petition to the King a few days later. If the Intolerable Acts were not repealed, the Colonies would also cease exports to Britain after September 10, 1775. The boycott was successfully implemented, but its potential for altering British colonial policy was cut off by the outbreak of the American Revolutionary War. 4 Samuel Adams Massachusetts cousin of John Adams; sometimes called "Father of the American Revolution"
^ Risjord, Norman K. (2002). Jefferson's America, 1760-1815. Rowman & Littlefield. p. 114. ^ McLaughlin, Andrew C. (1936). "A constitutional History of the United States". New York, London: D. Appleton-Century Company. pp. 83–90. Retrieved August 27, 2014. ^ a b Greene, Evarts Boutell (1922). The Foundations of American Nationality. American Book Company. p. 434. ^ Miller, Marion Mills (1913). Great Debates in American Hist: From the Debates in the British Parliament on the Colonial Stamp. Current Literature Pub. Co. p. 91. ^ Worthington C. Ford; et al. (eds.). Journals of the Continental Congress, 1774–1789. pp. 2:192–193.